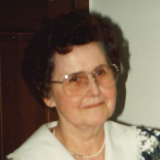 Christine Boyd Jacks, 97, of Camden Point, MO passed away April 11, 2019. She was born on April 20, 1921 to James Samuel and Gwendolyn Marie (Cockriel) Boyd in Camden Point, MO where she grew up and graduated from Camden Point High School in 1939. On July 9, 1942 she was united in marriage to R.D. Jacks. After their marriage they lived and farmed near Platte City until 1980 when they moved to Camden Point where they made their home. R.D. passed away on September 30, 1999. Christine worked at North American during WWII where they helped build planes for the war. She was a secretary for REA, Wells Bank, and retired from TWA after 25 years. She was a member of the Camden Point Baptist Church. Christine enjoyed antique shopping, reading, her cats and most of all being with her family. Christine was also preceded in death by her parents and brother Raymond Boyd. She is survived by her son Douglas Jacks and wife Cheryl; granddaughters Wendy Herberg and husband Carl, and Jaime Ward and husband Steve; great-grandchildren Cole, Thomas, and Ava Herberg and Madelyn, Gideon, Andrew and Lydia Ward; several nieces and nephews, other relatives and many friends. Visitation: 10:00-11:00 a.m. with Funeral Services at 11:00 a.m. on Tuesday, April 16th at Hixson-Klein Funeral Home, Edgerton. In lieu of flowers, donation may be made to NorthCare Hospice.